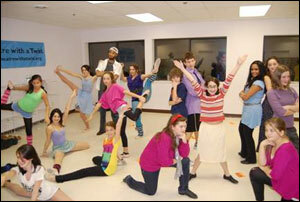 STOW — Theatre with a Twist will perform "Fame - the Musical" Jan. 14-16 at Hale Middle School in Stow. “Fame -- I wanna live for ever” is what we hear from this youthful and energetic musical which emits the cool vibe of the High School for the Performing Arts in New York, where a group of students travel along a 4-year grueling journey of artistic pursuits and academic work performed by our very own Broadway Bound theatre group. Some students have what it takes to be in the prestigious High School for the Performing Arts, while others struggle to find their inner talents. "Fame - the musical" was conceived and developed by David De Silva, book by Jose Fernandes, lyrics by Jacques Levy and music by Steve Margoshes. We have actors and staff from Boston, Arlington, Framingham, Hudson, Bolton, Concord, Lexington, Boxborough and Acton joining together to produce a show worth seeing. Directed by Katie Kuhl, musically directed by Mary Spinosa-Wilson, produced by Caroline Jarvis and choreographed by Jamie Horban, this show has an array of talented local youth. "Fame - The Musical" will be performed at Hale Middle School, 55 Hartley Road, Stow, on Friday and Saturday Jan. 14 and 15 at 7.30 p.m. and Sunday Jan.16 at 2 p.m.
For more information about Theatre with a Twist, go to www.theatrewithatwist.org. Posing for the song “FAME” in the Theatre with a Twist rehearsal studio in Acton are, from left, Front row: Nicole Paratore( Acton), Carly Usherwood (Hudson) Gabriella Ricciardone( Acton), Juli Badics (Acton), Sarah Varley ( Acton) Back Row: Maya Haigis ( Acton), Jackie Kiernan( Lexington), Brandan Kimm ( Boston), Maggie DiPalo ( Acton), Robin Wilson (Acton), Andrew Stewart ( Acton), Randy Wilson (Acton), Julia Wachtel ( Bolton), Anusha Purakayastha ( Acton), Sabrina Veo (Concord), Julianne Peebles (Acton). Additional pictures.